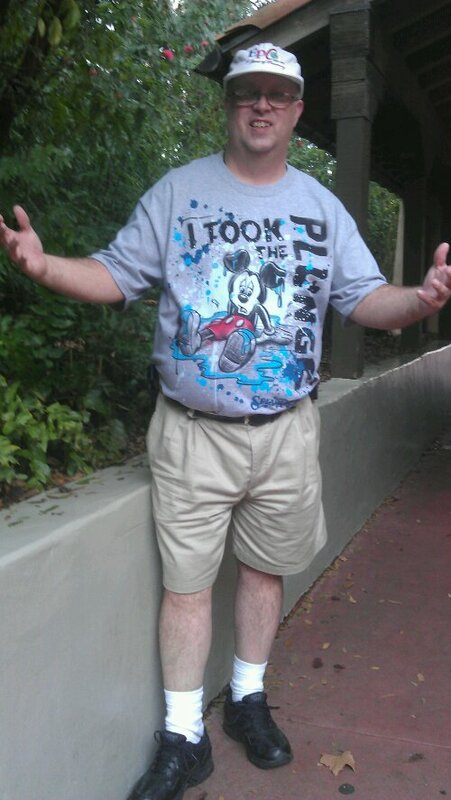 A 53 year old man walks toward The Magic Kingdom, he gets a flutter in his chest and feels his step getting a little lighter! As he passes under the train station and walks onto Main Street U.S.A., he gets a whiff of something delicious…Popcorn! He looks around at all the other people walking around and realizes that he’s not alone in what he is sensing. Oh, if feel great to be YOUNG AT HEART! Me, being fun and impulsively Young At Heart! Yes, it doesn’t matter who you are, or what the cares of the world may be, when you come to Walt Disney World, you have permission to be Young at Heart! It’s time to put away the everyday, because it isn’t everyday around these parts! You can let the business of your life rest as you enter into the peace of the Disney “bubble” and just let it all wait for your return, later. When Walt Disney decided to enter into the theme park business, I can’t help but imagine that along with providing a place for entire families to play together, he was giving each of us permission to be kids for just a little longer. There is nothing that makes me smile wider, or laugh harder, than when I am at the Walt Disney World Resort and in one of the theme parks! I forget that there is a life full of stress and responsibility and allow myself to relax. The cares of the world wash off my shoulders and I am home! When you visit the Vacation Kingdom, I would like to suggest that you forget the rest of the world for as long as your vacation is set to last. If needed, shut off the ability to receive calls on your cell! I know with all the new technology, it’s necessary to carry your smartphone, but you don’t have to answer any calls, unless it’s a lost family member somewhere on the property. The boss can wait! The bills can wait! Anything that steals from your vacation is a vacation thief! It’s time to give yourselves permission to be Young At Heart!! Be a kid at Walt Disney World! Visit the characters that you grew up with, and meet the ones your kids have gotten to know, too! Enjoy the attractions, rides, shows, or whatever else you want to take part in while visiting WDW. And, don’t forget to allow yourself to have FUN!! Remember the old song? Fairy tales can come true, it can happen to you, if you’re Young At Heart! !